Dave, the host of the morning show on KLOR, and I have been wearing tuxedos all week long in celebration of being in our brand new studios inside the Poncan Theatre. It's been a wonderful experience for me, every morning, looking at that "L" on the tuxedo shirt tag, and further realizing that I'm no longer that morbidly obese man I once was. I have many wonderful reminders every day, like effortlessly slipping on my size 36 jeans--even after they've just been washed and dried, but still...sometimes, it's hard to imagine or accept. It feels good, and don't dare think I'm complaining, because I'm not...I'm just so happy in this new freedom. All of the chains that morbid obesity had on me, are broken, and I must pinch myself often to believe it's not just a dream. I never wore a tuxedo before I lost all of this weight and before I started riding several months back, I hadn't been on a bicycle since I was a kid. I thought it would be a novel idea to do them both at the same time. I did and I wrote about it in my last post. It was an amazing experience. "I had Subway for dinner tonight. I felt just like Jared walking into the Subway and ordering that footlong black forest ham with no cheese and a very, very small strip of light mayo. I could've had the cheese, but I saved the calories for that small strip of light mayo. I actually had enough calories left to eat the whole thing, but I just couldn't do it. It's almost as if I don't trust the nutritional information at subway dot com. I know what it says, but man...that's a lot of sandwich for 600 calories! I did eat 2/3 of it and I still have 190 calories left for the day. What's funny about this Subway trip is that I've always had stand-up material on Jared and Subway. How thanks to Jared, every time I go to Subway, everyone looks at me like I'm next! I would go on to say that Jared has made it perfectly acceptable to eat a loaf of bread and a pound of cold cuts and still lose weight...”Hey Sean, is that another footlong? Good to see you're finally cutting down”. I would talk about my plan: The Pizza Hut diet. 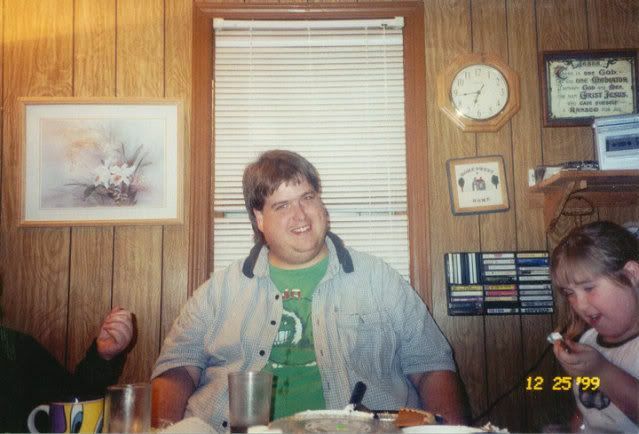 A large Pizza Hut pizza everyday and a two liter of Pepsi, and I bet I would still lose weight...And everyone would ask...”Sean, what's your secret?....”duh, THIN crust”. Big laugh, and goodnight, I'll be here all week. This tired old stand-up routine of mine has a lot of truth in it. You can lose weight on just about anything, BUT...is a diet with a limited variety of food or all of one food really teaching you to eat right? That's my biggest problem with Jared's plan. 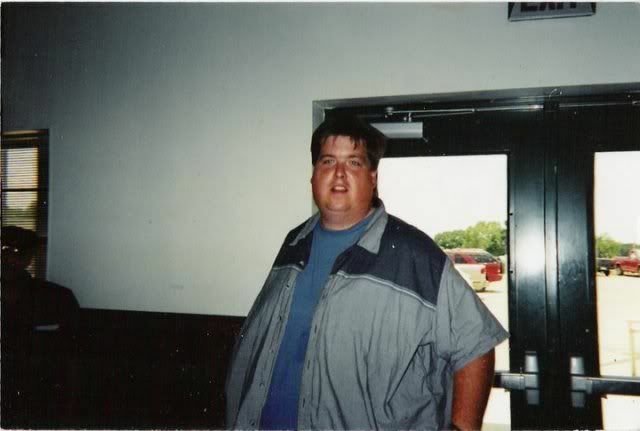 Eating a sub for lunch and dinner everyday helped him lose weight, and after USA Today broke the story, it made Jared a millionaire as a Subway spokesperson. But I don't think eating the same food everyday would teach me how to eat right once I had reached my goal. Of course Jared has had plenty of financial incentive to keep the weight off but I bet he really had to get a crash course on eating normal once his daily Subway trips were over." 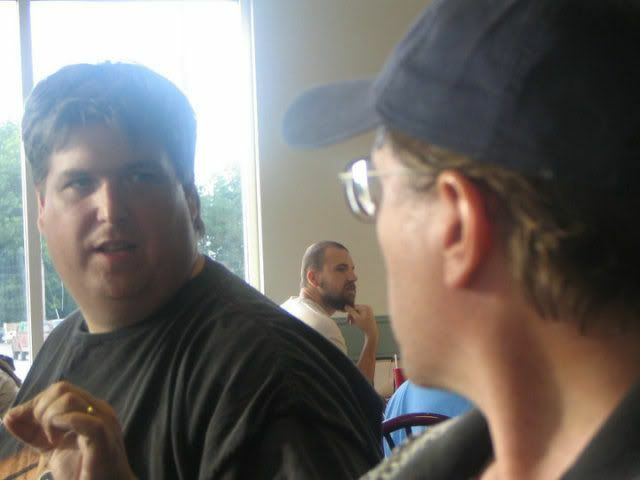 "Every now and then someone will ask me...”so, what diet are you on?” or “what are you doing to lose the weight?” I tell them I'm counting 1500 calories a day and exercising. And they accept that. 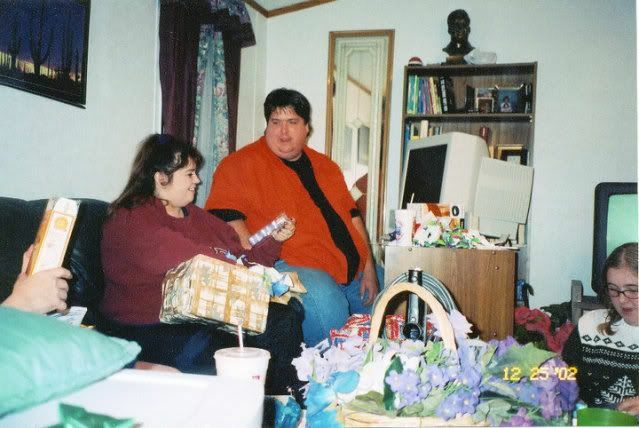 But if I told them I'm on the “hamburger, fries, sour cream chicken enchilada, deep fried chicken nugget, footlong ham sandwich, oatmeal, taco, tostada, burrito, steak, baked potato with sour cream, mashed potato, corn, rice, ice cream, and birthday cake with butter cream frosting diet” they would think I was crazy. But I've had everything I just mentioned at some point during the last eleven days. That's the beauty of counting calories. Counting calories allows you to eat whatever you want while forcing you to make wise choices and having controlled portions. It's really helped me understand the definition of a serving. If I were eating a pre-packaged bar for breakfast and a couple of shakes a day I wouldn't be getting the same nutritional education and real world eating experience. I still have a lot to learn, and it's never boring! And I can't wait to weigh on Tuesday." 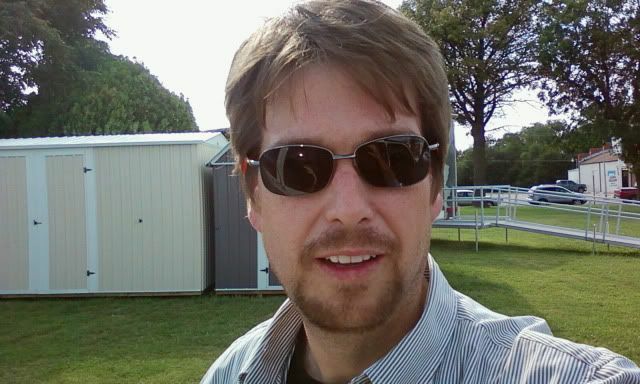 "In the last ten days I've had a lot of fun with this blog. And there will be much more fun in the coming days, weeks, and months. But I couldn't write this blog tonight without mentioning these two very important people and the struggles they face this evening. 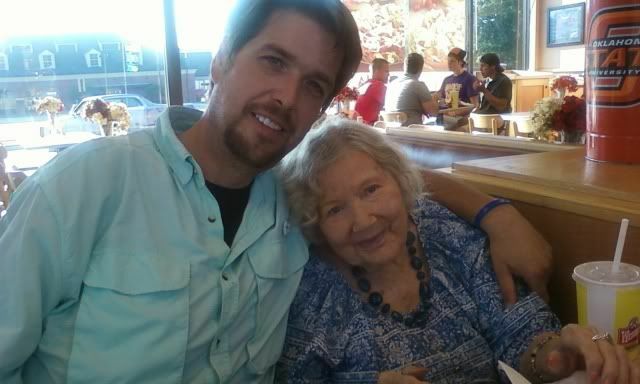 My day to day struggles and experiences in losing weight are so minuscule in the overall big picture, however I believe that both my friend and Aunt Violet would want me to write tonight and keep it up. So I will. Because maintaining focus and staying on track during times like these is paramount to the overall success of this journey. I know that everyday will not be perfect. I know that facing everything that life throws our way and still maintaining our focus is crucial. It's crucial because I'm not doing this just to lose the weight. I'm doing this to change the way I handle food and exercise everyday for the rest of my life. I'm not saying that I'll count calories forever, but I'm teaching myself along the way how to eat...how to exercise...how to be healthier. I'm changing old habits into new positive habits, positive habits that will be with me through many days like today. And I will continue to learn these new ways of living. For me, depressing news can and often is as big of an eating trigger than anything. For some it has the opposite effect. I just know how I normally handle things. And I've always turned to food. Not today." That was a big important paragraph for me to write on Day 10. 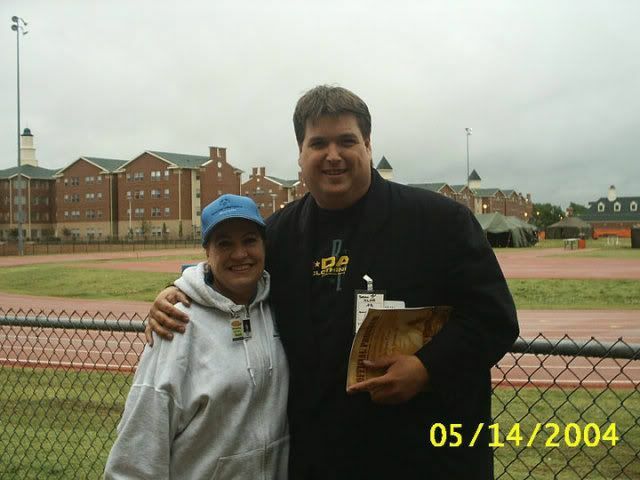 Deciding that my weight loss journey couldn't and shouldn't be affected by the everyday ups and downs of life, no matter how tragic or depressing, no matter how stressful and anxiety filled---was the beginning of my "steel curtain zone," an imperative part of my success. And made possible only by embracing 100% self-honesty with myself about my behaviors with food---Voiding the excuses and rationalizations that always made me feel better about failing. My "performance" with food and exercise had to be separated from my emotions and daily stress level, or else I wouldn't be where I am today. Because life doesn't become a bowl of cherries just because we decide to make positive changes. Over the course of the last two years, the subject of fat-free foods have come up many times...do I eat them? Do I realize the calories I could save if I did eat them? I found a small excerpt from Day 9 that really clarifies my position on "fat-free:"
"I don’t buy or consume fat-free stuff. Yuck! Are you kidding me? Fat free cheese should be against the law. The Fat Free boom in the United States has made billions for companies all over the world. I’ve never understood how something that taste so horrible can still sell! My philosophy on the whole Fat-Free subject is real simple: In most cases, I would rather have a small portion of the real thing, then a big portion of the fat-free version. I think it’s funny when companies put Fat-Free on the label of foods that have always been fat free! Marketing, marketing, marketing!" "I have a question Sean. I've been thinking about it for a couple of weeks, then you sort of bring it up today. First I'm really not sure how vigorously you exercise each week. Let's assume it is just what is a normal recommended amount, :30 mins or so 4 or 5 times a week. If you keep up 4 or 5 times a week, and you stay at 1500 cal/day for two more years. Do you suppose at some weight your body would just find its balance? Let's say you did this and in three months you were down to 215 then you continued on just living and working out as recommended and staying at 1500/day. Can you image your body just finding its place at 215 and staying there, healthy and stable? (or where ever your body stopped dropping) Or, do you think at some point your going to have to "quit" what you've been doing and change it so you stabilize at some place of your choosing (like 230) Will your mind choose where to stop, or will your body tell you where it wants to be at 1500/day?" "I agree with Chris Collins. 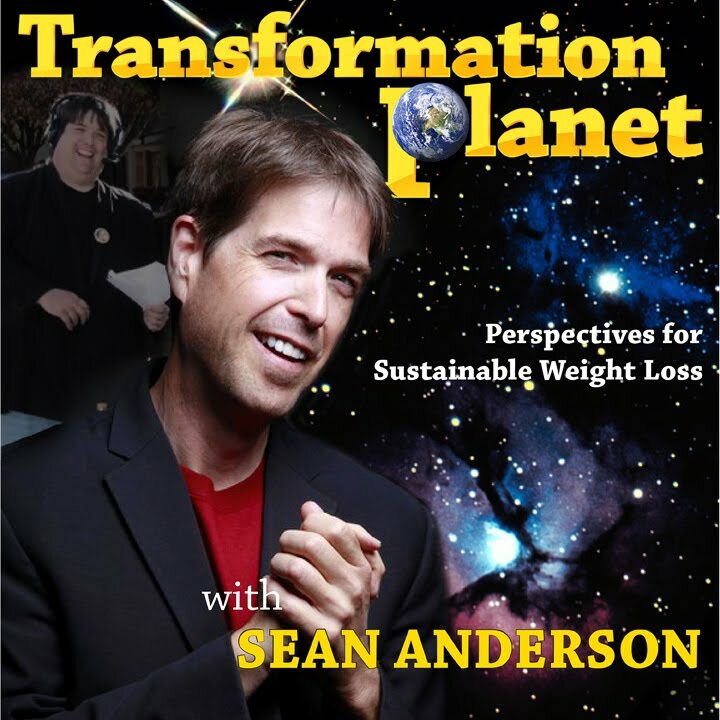 Years ago in a hospital weight loss program -- the kind where you fast and your body thinks you are starving and you gain it all back in about a minute after you go off of it -- I did get a course in the "math" of weight loss. The reason that the weight loss slows down is simple math. It takes fewer calories to maintain weight -- so the lower you go, the more you have to exercise, or the more you have to reduce your calories. So just take your current weight and multiply it by 11 -- that's your maintenance number -- if you stay below that number, you will loss a pound when you accumulate 3500 calories of deficit. So currently you are losing a steady 1 lb a week which is fabulously healthy. If you stay at 1500 calories (which is my magic number) and stop losing, then you have to increase the exercise to create the deficit. Those math-facts are why people have so much trouble with the last few pounds. And the idea of finding your level makes sense to me -- staying on 1500 and doing what you are doing will eventually lead to a level which at which you won't lose more until you exercise more or drop your calorie allowance. It's nothing more than that." As my exercise routine continues and becomes more advanced, dare I say...weight training, some adjustments will surely be required. In answer to your question Chris, I think that the body will naturally find it's place. As long as I give it enough fuel and enough exercise, it'll all fall into place without me getting too worked up in the science of it all. If I were to decide where it all stops, I think it would be going against my bodies natural movement and level. I personally believe that when we try to decide where we should be, it's that kind of focus and belief that can lead to unhealthy obsessions over weight and appearance. A natural progression and evolution of our choices and the consequences of those good choices, will ultimately--I believe, put us right where we're supposed to be...healthy. Saturday morning started earlier than most Saturdays around here. 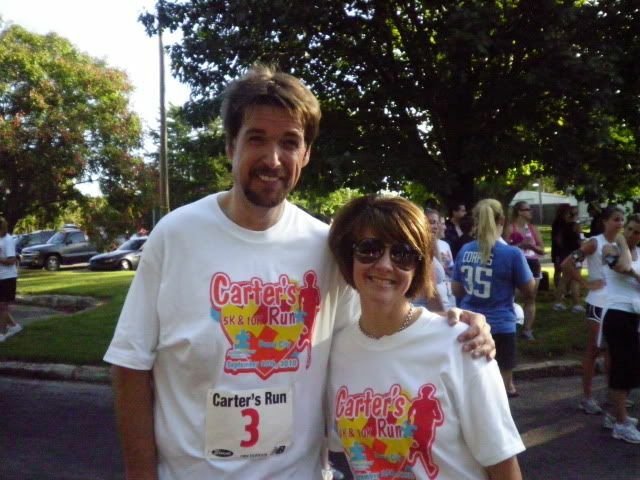 I was up early, getting ready to participate in Carter's Run for Autism Speaks. It was an organized and certified 5K or 10K, I chose the 5K. I know, I know---I did the YMCA 10K last November, and I probably could have survived...check that, I would have survived the 10K Saturday, but still---I was happy with the 5K, and very happy to support a wonderful cause. A bunch of people showed up, the turnout was over the top! Dr. Amy was there, I've written about her many times in these writings---and it was a pleasure to walk/jog alongside her in this event. At one point, we even broke out into an all out foot race/sprint. 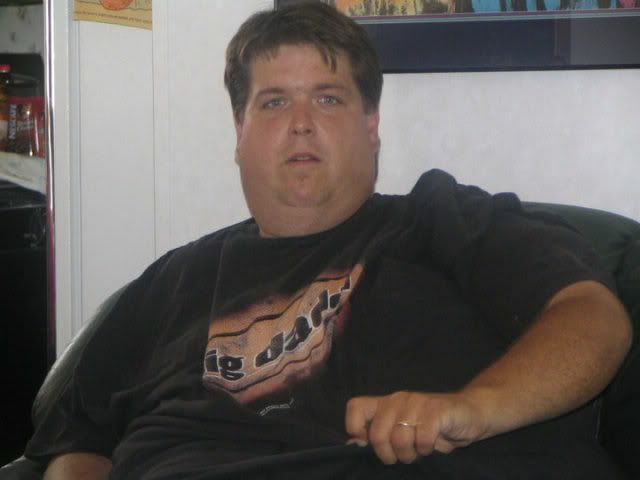 Imagine that...how foreign the mere thought would have been to 505 pound Sean. It was incredible. 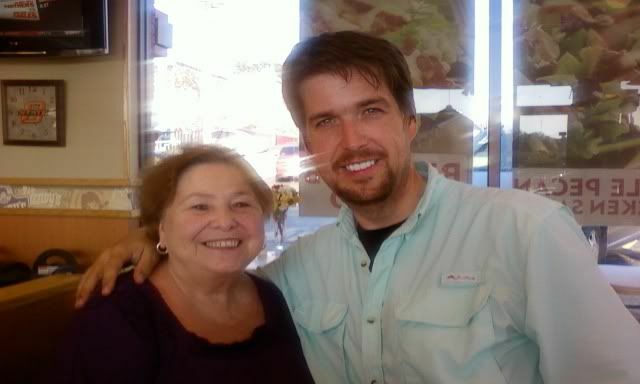 I met Jill Albright, who told me that she's been a regular reader of this blog since Day 1, and that was incredibly cool!! 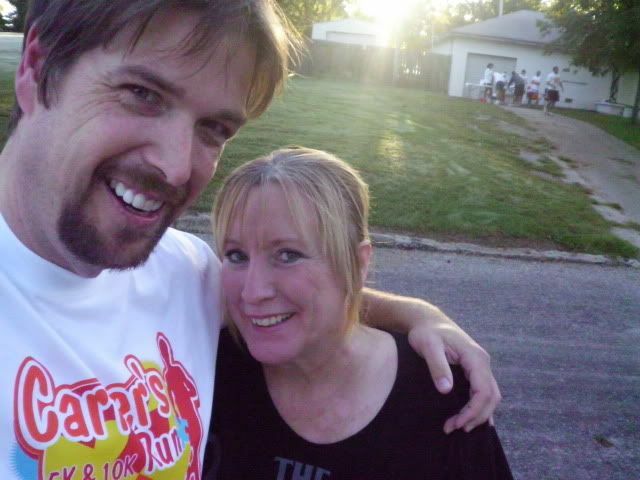 I also had a chance to walk/jog/run alongside a devoted reader and big supporter, Lisa Love. Lisa and I actually crossed the finish line at the same time. 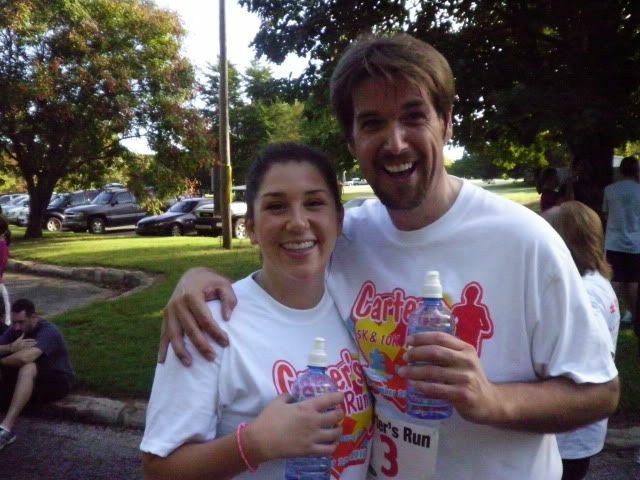 As we both approached the finish and were about 50 yards shy, we decided to give it an all out sprint. The official time (and I have no idea--didn't check) wasn't anything to write home about I'm sure, but it was a great time for a great cause, and a wonderful workout on a beautiful Saturday morning---and that's worth writing about every time. I was trying to figure something out on the computer monitor while snapping a picture that shows a different perspective in the contours of my slimmer face. This one did the trick. 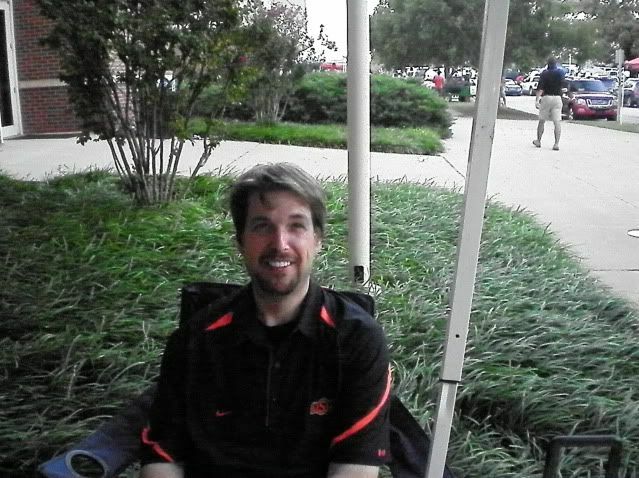 Lisa Risner, a facebook friend writes in response: "You don't just look different, you LOOK different. Healthy looks great on you." Another tuxedo picture. 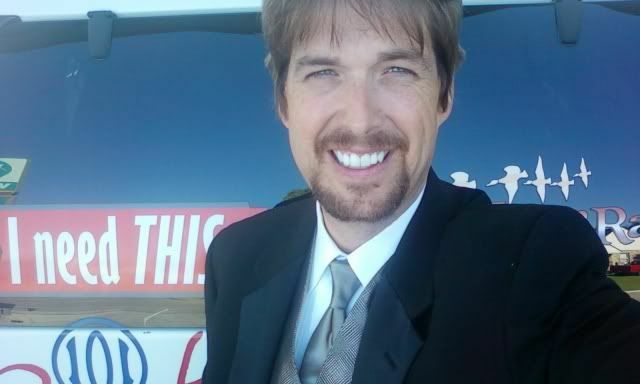 I was so tired of wearing the tuxedo, I took it back to Spray's Jewelry, Gifts, and Tuxedos minutes after changing. Once in a while is awesome, feels good...but five days straight...oh my goodness. 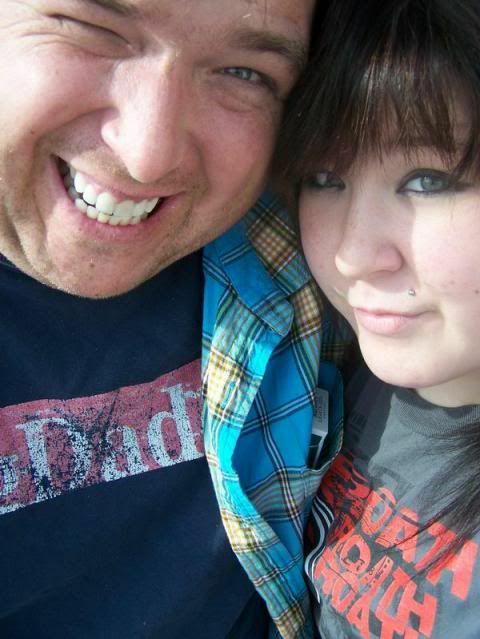 Big before picture---at over 500 pounds, with Courtney--my youngest daughter. 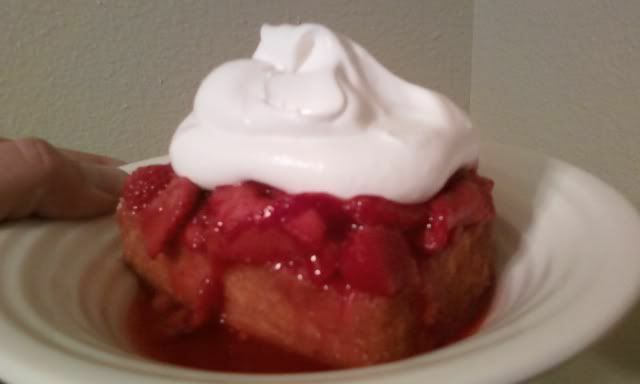 Angel food cake, 130 calorie portion...fresh strawberries allowed to "juice" under the influence of a little real sugar---50 calories, and a dollop of Cool Whip for 25 calories. Tell me that doesn't look like a 500 or 600 calorie dessert...it was amazing!! 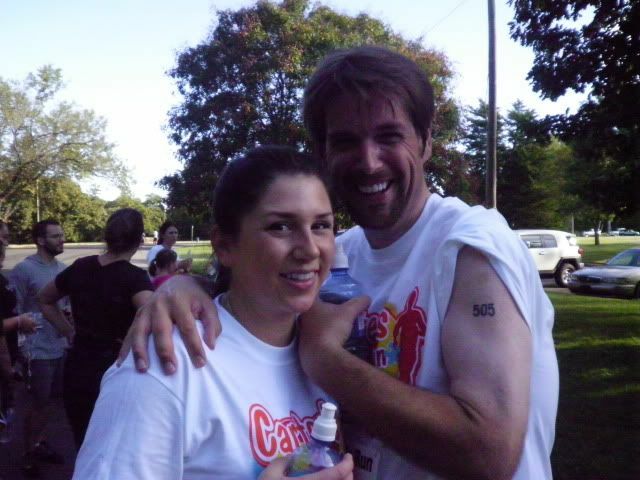 Showing off my "505" tattoo and taking a picture with Dr. Amy Cox! Again with Dr. Amy. Her and her husband Dr. Jeremy Cox have an incredible practice known as the Ranch Chiropractic Wellness Center. They do incredible things there, that go way beyond simply getting "adjusted." It's a whole wellness approach that really energizes and enthuses their patients. I met Jill Albright!! She said to me: "I've been reading your blog since nearly Day 1," and she's local to me...I can't believe we hadn't met before now! With Issac Cervantes. Issac is an incredibly talented child actor. He most recently can be found in the independent film "War Stories." 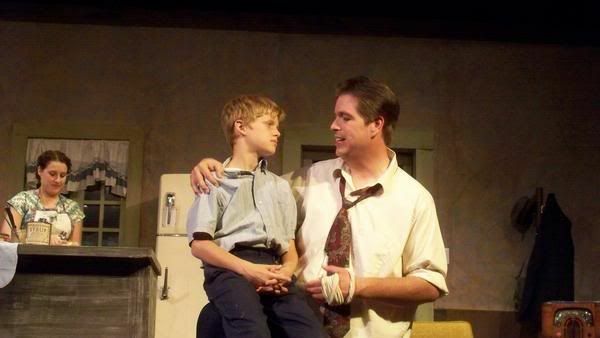 Issac played my character's son in the play "Call Me Henry" last year. Having a lead role in a production like that was a real dream come true for me, something I doubt I would have ever experienced as a 500 pound man. Remember this picture with Issac from a year ago:? Lauren Donahue is in the background as "Doris," wife to my "Hank." Issac played "Henny." 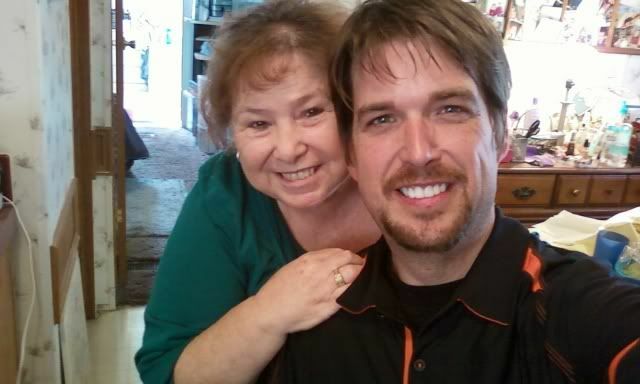 With friend, reader, and big supporter, Lisa Love. Congrats Lisa--you did wonderful! 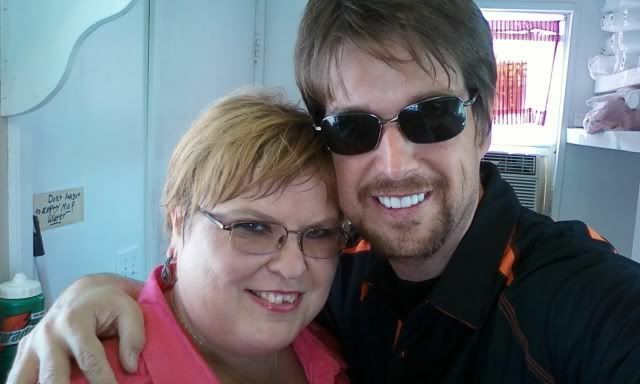 With Melody Young, one of the organizers of this big event. Melody is in a group of Ponca Citians that are in training for the New York City Marathon in November. It's funny, before I met Melody in studio earlier this week, I actually passed her and her NYC Marathon training group as they ran in the 5am hour---and I was in my tuxedo, riding my bicycle to work. Leftovers...very nice. Minus the mac and cheese and with roasted red potatoes instead of mashed, the calorie count was just over 400 calories for the entire plate. It was soooo good, even the second time around. 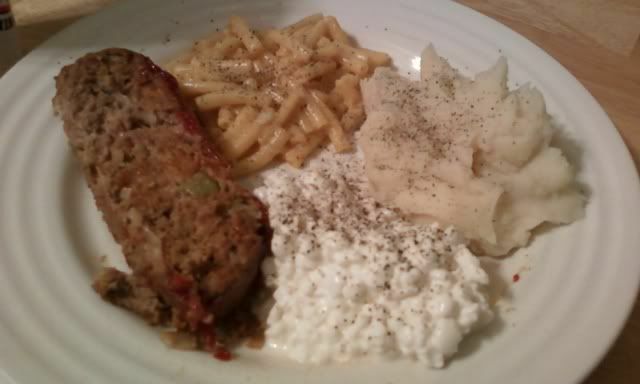 As you can see, I enjoyed this meal at the keyboard, writing and eating...it's what I do. I grabbed a laptop Sunday evening and headed for a peaceful place to clear my mind. I'm lucky that there are several wonderful locations around here that would qualify. I stopped at Subway and grabbed a six inch Black Forest ham on Italian with half the cheese they normally use, loads of veggies, the "thinnest strip of light mayo you've ever put on a sandwich," (that's what I tell them every time), and salt and pepper, not a bad dinner for 350! I didn't need chips and a drink, I packed a banana and some water. I was set. 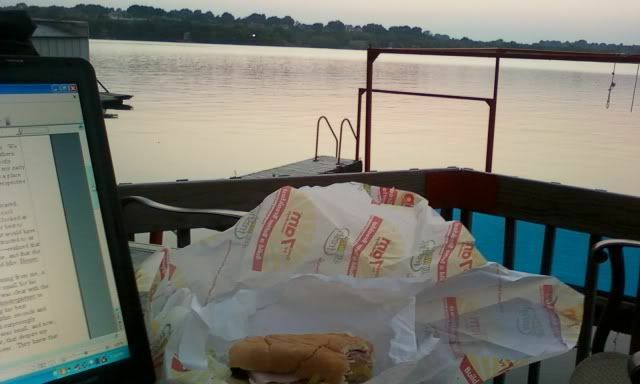 I decided to call a friend who has a private dock at Lake Ponca and request permission to use the setting for an evening of reflection and writing. I arrived and just sat there, staring at the water, listening to nature and thinking about what an incredible two years it's been. I finally decided on a little mood music, so I put on the iPod and turned up the soothing sound of Christopher Cross's "Sailing." When I want to get reflective, that song just stirs me deep. It's beautiful...just like the last two years. It hasn't been perfect and we've certainly experienced life changing non-weight related issues, but really--this journey out of morbid obesity has been, for the most part, a thing of beauty. The water out there was so calm and it was so quiet, not a soul around me, it just opens me up in so many ways. I look forward to spending more time like Sunday evening...it was so perfect. Staying focused is sometimes a very difficult thing to do. Most of us know what our triggers are. Triggers are situations and circumstances that put us at our weakest point in terms of staying on track. My trigger is stress. Any and all stress. Job stress, financial stress, family stress. It all adds up to a big mess of stress. And I'm sure you've heard people say...”I'm an emotional eater”...aren't most of us? I'm not just an emotional eater, I'm also a celebratory eater and a spur of the moment craving eater, I'm a “ah, the heck with it, give me the double decker with extra cheese and bacon” eater. Identifying your triggers is important. What makes me feel the urge to eat a couple thousand calories in double cheeseburgers and ice cream? Stress. I identified this trigger several years ago. And for the longest time I've used that as an excuse not to get busy with this mission. “I'm just too stressed out to get started right now”...Or, after a successful couple of days, totally going nuts on a half gallon of tin roof sundae, then thinking...”I can't do this right now because things are just too stressful. So recently I had to ask myself: If I'm waiting to have a stress free life before I start losing this weight, will I ever start? The answer was no. We all have stress in some form. Stress is part of daily life for most people. Stress can be so many different things. So I realized that if I were waiting for my world to be completely perfect and stress free, then I would never, ever, ever start this. We have to adjust our strategy in the face of our triggers. We have to stop long enough to ask ourselves, will eating this really improve my situation? What can I do besides over-eat that will help me deal with this issue? I've turned to food for comfort for so long, that I know how incredibly difficult this can be. My smart and beautiful wife mentioned taking one day at a time in a comment she left on yesterdays blog, and you know what? She's so right. One day at a time I deal with cravings, one day at a time I deal with triggers, one day at a time I succeed. Eventually all of those “one day at a times” will add up to an amazing result. It certainly has added up to results I could have never imagined on Day 8. And where I'm now headed is beyond my wildest dreams. When I originally wrote that Day 8 post, I hadn't arrived at certain key points of understanding. The epiphanies about the imperative role of self-honesty, self-responsibility, letting go of the blame, and letting go of all the excuses and rationalizations--was still a ways away, not too far, but...I was discovering these things naturally through practice, and the mind blowing and extremely comforting epiphanies about these, were like bulldozers clearing a path ahead of me. 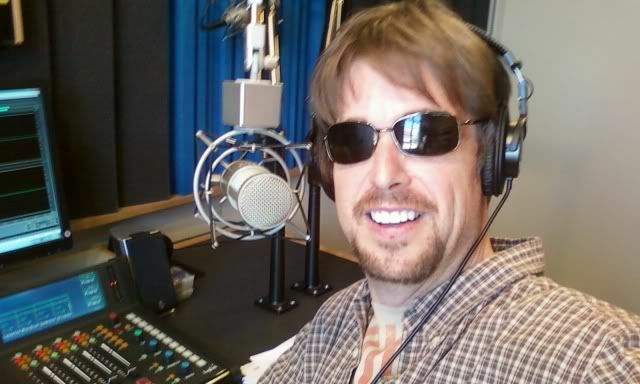 The radio station I work for moved its studios into the historic Poncan Theatre. My first morning in the new place was Monday. 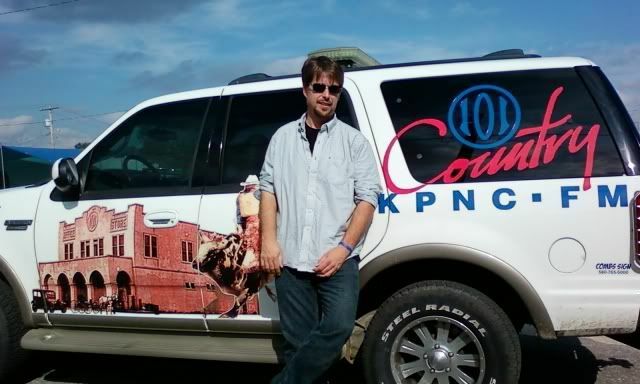 KLOR and KPNC are within a few feet of each other in twin studios, and everything is the latest and greatest. It's a playground of technological wonders! As in, I'm wondering if I'll ever know how to work it all or know exactly what all of the displays mean. I think maybe if I had a pilot's license, I could understand all of the displays a little better. It's beautiful! 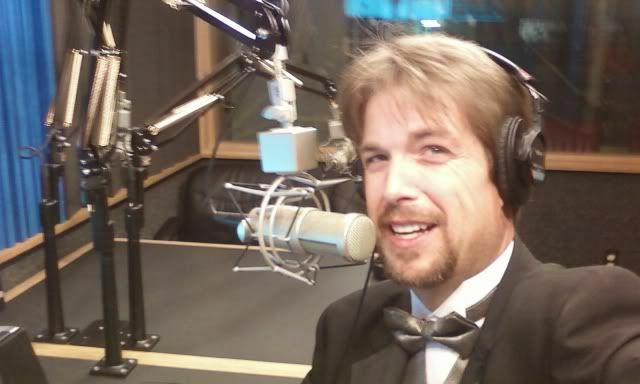 To celebrate the new studios, the morning guy at KLOR and I, will be wearing tuxedos everyday this week. 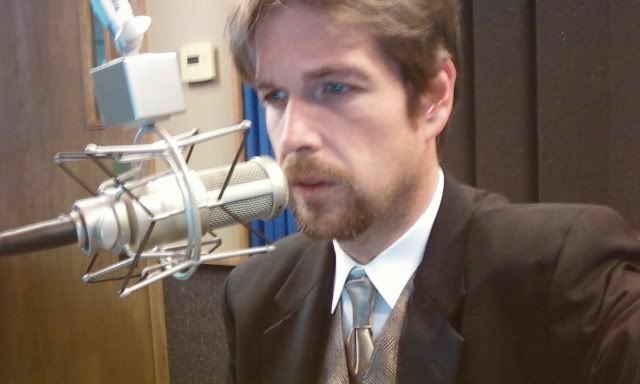 Wednesday morning I decided to ride my bike to the studios, in the tuxedo. It's only a five mile round-trip bike ride, but in the tuxedo it felt much longer. While riding to work in the peaceful 5am hour, I thought about how at my heaviest, these two things seemed like activities I would never do in my life, ever. Ride a bike and wear a tux---two things that don't happen often, or at all when you're in excess of 500 pounds...and here I was, doing them both at the same time. I rode with a triumphant spirit! I actually had three offers to give me and my bike a ride back home, but I couldn't accept those offers. I said I would ride to work, now I must ride back---and so I did, the back roads all the way to my apartment. Several people did double takes at the sight of a man in a full tuxedo riding a bicycle. It was great exercise on my single speed classic beach cruiser. 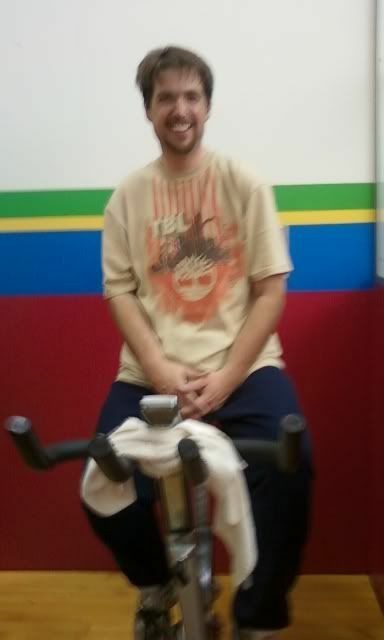 I miss the gears of my old bike, but I still absolutely love riding this cruiser...it's classic. One of the benefits of the studio move is we now have a full kitchen. You know what that means, right? Pita pizza lunch time at Team Radio! I love making them and have for me and a couple of my colleagues everyday this week. They've looked at the pita pizza pictures on this blog for so long, and now they know what all the fuss is about. With a Joseph's 60 calorie pita, some mushrooms, pizza sauce, and a pre-portioned slice of mozzarella, you can have a personal pita pizza for under 140 calories...and with a calorie value like that, why not have two for lunch? I opted for one and a banana today. I also snacked my way to approximately 150 calories worth of a salty snack mix. Those little bite sized hand-fulls add up, and I grabbed a few throughout the day...little pretzels and Chex looking cereal pieces. Tomorrow I'm taking lemon marinated apple slices and bananas. I've been eating at home nearly every night (except for the Subway sandwich at the lake) and staying comfortably within my calorie range. I recently decided that I need to raise it up to 1800 per day, but since saying that, I've still been doing the 1500. I honestly think I would be doing my metabolism a favor by bumping it up. I'm not an expert of any kind, but I'm pretty sure that my body is VERY accustomed to what I'm doing. The pound a week weight loss, although steady and nice, is very revealing. I honestly believe that given my current weight and calorie budget, plus my workouts--I should be dropping a little more. But whatever...I mean that in a good way. I may not be at goal officially, but I feel like I'm already there everyday. I feel good, very good. And when I wash and dry my size 36 100% cotton jeans and they still fit comfortably, well--that's all the proof I need to know that things are going wonderfully around here. I just received my cholesterol numbers in the mail from the test results of my latest blood donation. Drum roll please....152! It's cool, because not only are the numbers good, but beside each line on the report it says "normal." After being abnormal for so long, "normal" feels really good! 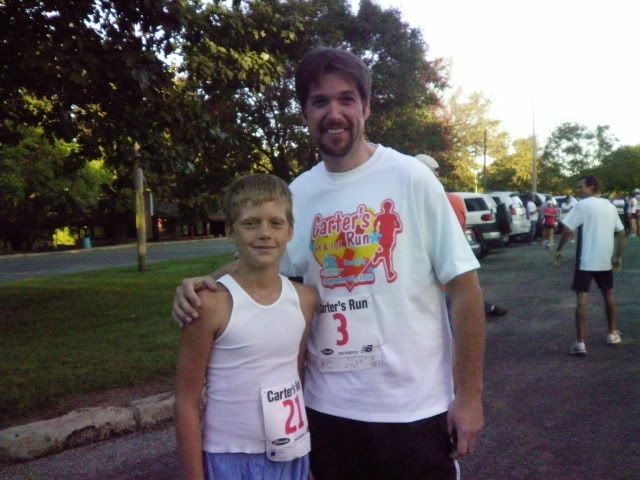 I plan on doing an organized 5K this Saturday morning for Autism Speaks. 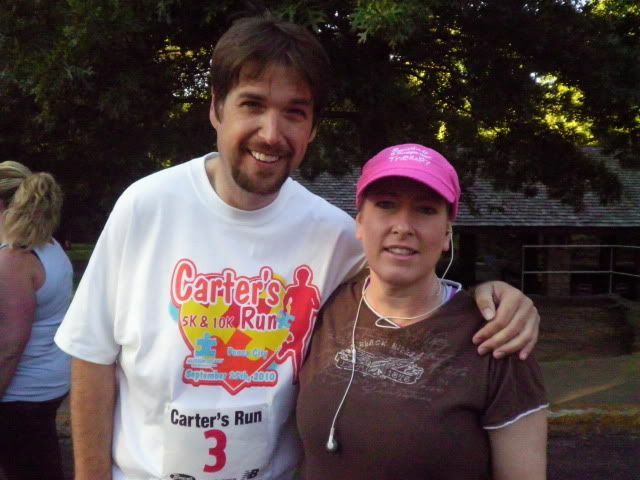 It's called "Carter's Run," and then the following Saturday, I'll be doing another organized 5K with the Ponca City YMCA on the grounds of the brand new Y facility. I can't wait for this new YMCA to open, oh my---it's going to be absolutely incredible! My hair is shorter, making for a big "lost" before picture that looks a little different. 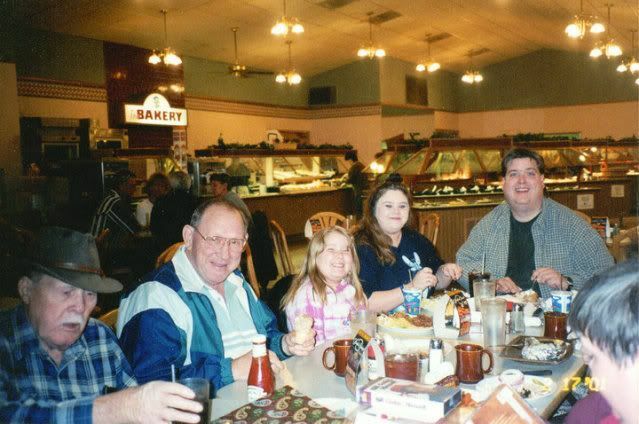 We were at a big buffet style restaurant in Stillwater. 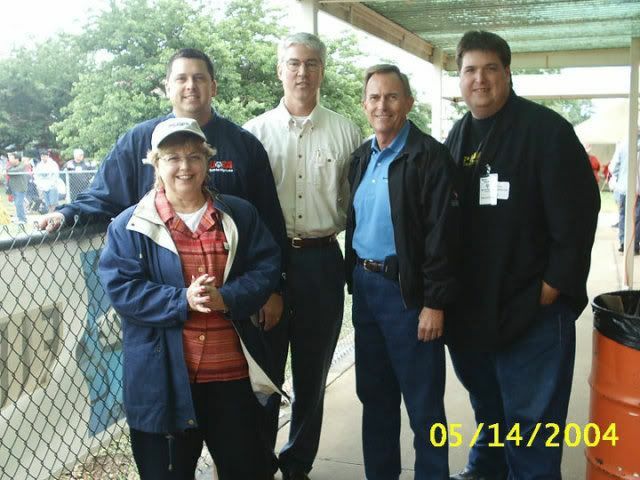 My late grandpa and late Uncle Gayle Hadley are pictured in this one. In the production studio upstairs from the on-air studio...The whole place is amazing!! Dinner the other night. 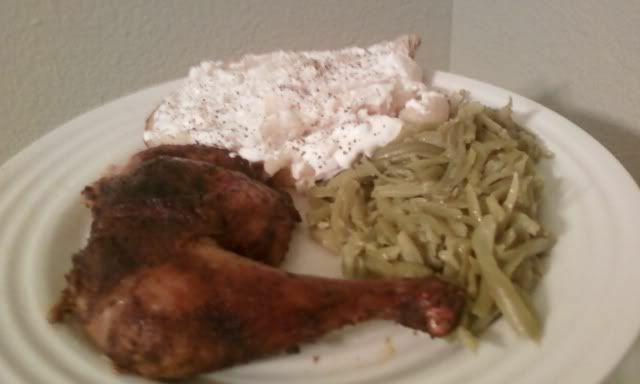 Smoked chicken...and yes, that's 60 calories worth of sour cream on the baked potato...I stay away from the butter, simply because it's such a horrible calorie value---just give me a little sour cream with salt and pepper and my potato is good!! The French style green beans have 35 calories worth of pepper jack cheese melted into them and mixed up real good...Incredible dinner for under 450 calories. Nice low calorie breakfast! 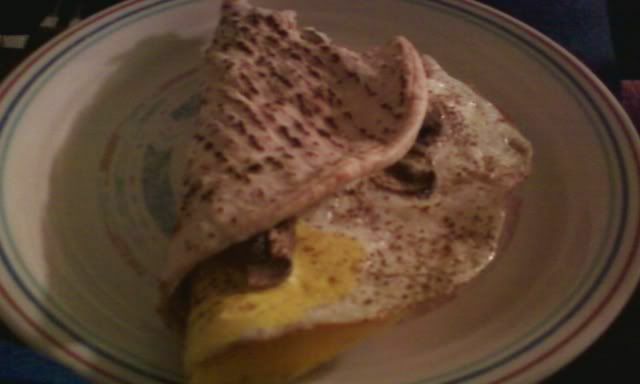 A one egg white and one whole egg and mushroom on a pita breakfast, folded over like a big taco....can you believe, only 150 calories total? Yep, it's true! Wednesday evening meal. 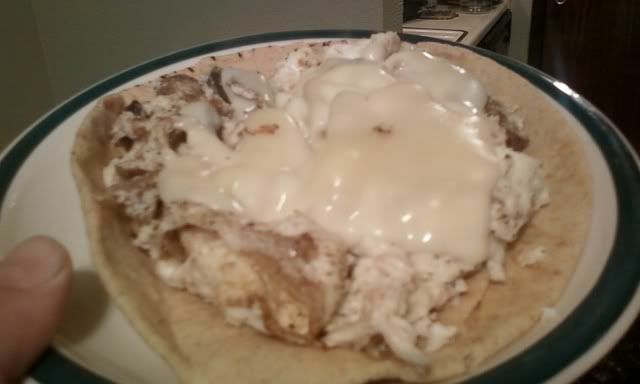 I grilled a small chicken breast---sliced it up and put it on a Joseph's Pita...topped with 50 calories of mozzarella and 35 calories of pepper jack underneath, then baked it at 375 for 7 or 8 minutes. 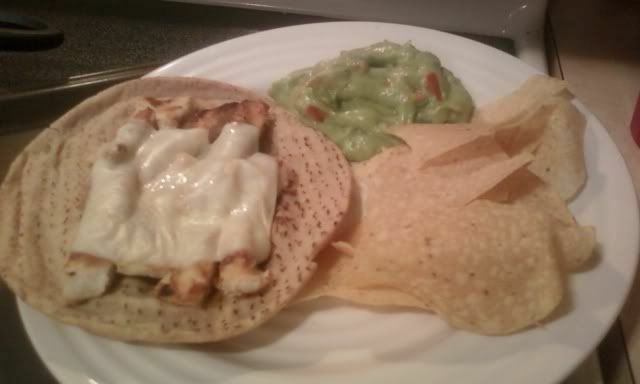 It was a chicken and cheese fajita with a decent serving of fresh guacamole and chips. With 150 calories of guac, 140 calories of chips, and the 250 for the fajita---the entire plate was 540---filling and delicious, very good! 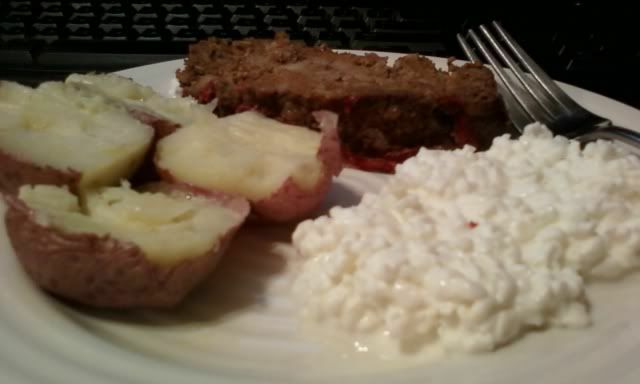 Another low-cal breakfast creation, this one with mozzarella cheese...mmmm, that's good stuff right there!! 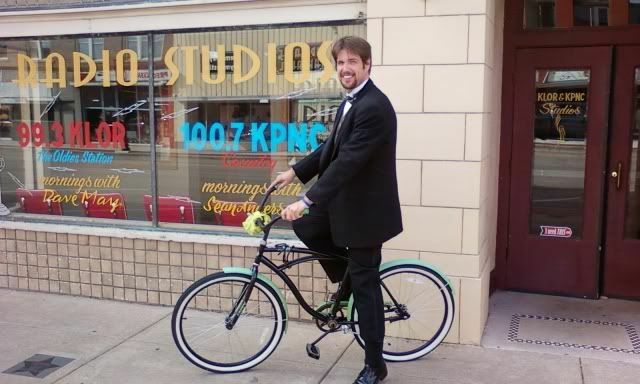 On the bike outside the window-front studios in Downtown Ponca City, Oklahoma...getting ready to ride it back home---tuxedo and all, in broad daylight. I took the back roads through neighborhoods until I reached the main street North to my apartment...It was a once in a lifetime experience...and two things that, at one time, I wasn't sure if I would ever do...ride a bike and wear a tuxedo. Doing them both at the same time was really cool to me. Thank you to everyone who offered words of encouragement about my two-year anniversary of Day 1. It has been an absolutely life changing two years on many different levels. Someone near and dear to me recently referred to me as "amazing." And as much as I appreciate the compliment, I must disagree. When you look at my transformation--the pictures, the writing, etc., and you think I'm amazing, my hope is you'll see that you too have the ability to do amazing things. I've said it many times and it's so true, I'm no different than you or anyone else. 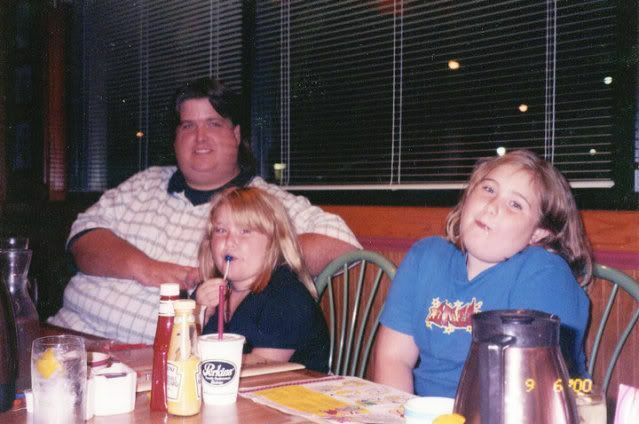 What has allowed me to break away from a lifetime of morbid obesity? A change in perspective. A different focus. A decision to stop believing the excuses and rationalizations that always made me feel better about myself and my bad choices. I decided to get real with me. 100% self-honesty about my choices and behaviors---calling an excuse an excuse and a rationalization exactly what it is, nonsense, these make the foundation for the success I've enjoyed. The food and exercise part is naturally the least of my focus, because when the real focus is on the mental aspects--the food and exercise part naturally and beautifully fall into place. That's exactly why I say and have said over and over---keep it simple in the food and exercise department. I think about how many times I allowed the food and exercise part to overwhelm me---I was complicating the process---I was fighting the wrong battle. "This time it's for real. Nothing can convince me otherwise. Not even a nightmare. I had a dream last night that I had gained back over a hundred pounds. It was a vivid dream, but I wasn't buying it. Have you ever done this? Where right in the middle of your dream you remind yourself that it's just a meaningless dream? Just a collection of your subconscious thoughts, fears, hopes, dreams, and experiences---all blended into one crazy late night movie playing inside your brain. It didn't startle me at all, not even a little. In my dream I had a third person thought of yeah right. I guess even my dreams don't quite realize just how different this time is from all the others. Dreaming about gaining a large amount of weight back and binging on ice cream and pizza didn't scare me, but it does make me wonder if deep down---like seriously deep down, do I really worry about that stuff? The mental changes I've made make it nearly impossible to go crazy on anything. I feel too good these days. I love the way I'm starting to look. More than all that, I love the way I have a clear perception of my success that includes a profound understanding of why I never had it before and why I'm having it now. This time it's for real. That crazy dream did nothing to shake my confidence, it simply gave me something to think about, and a paragraph for this blog. Because when it's for real, it's just too solid to ever believe we could go back. There is no gear for reverse on this happy train. So there! Take that crazy dream weaver!" "I received an e-mail from a reader who acted shocked that I ate a deep fried Oreo the other night. They were very nice about it and concluded the e-mail with “as one of your other readers said, I guess you've earned that break.” First of all, thank you for reading, secondly---it wasn't a “break,” or a “treat,” or a “celebratory” deep fried Oreo. It was simply a deep fried Oreo. I made room for it in the calorie budget and enjoyed it immensely, perhaps you watched the video I posted, that was a genuine reaction! I wasn't “off-plan,” there is no “plan” here, you know that, right? The only thing that might resemble a plan is making good choices in terms of portion size and overall consumption. “Good choices” certainly doesn't mean never eating something we feel is forbidden. These are real life eating situations, and if a deep fried Oreo or something else equally as sinful shows up at the “party,” then it's great to know that I can handle it in a perfectly responsible way. Adherence to a strict 1500 calorie budget has taught me to make wise “investment” choices regarding portions, and sometimes that means having a deep fried Oreo, or splitting a piece of cheesecake with Courtney, or enjoying an ice cream cone. You really must throw away your list of “forbidden” foods. The “forbidden” part shouldn't exist. It only serves to discourage us if we choose to enjoy even a small portion. The thought of, oh my, I just blew it is a powerful thought that can lead to complete destruction of the changes you're aiming to make. Nothing is off limits. If you think I'm nuts, I've got the track record to prove I'm not." Friday morning, my facebook status update read: "Hungry! Going to eat a whole pizza for lunch and wash it down with a half gallon of ice cream. Does anyone care?" Amy wrote: "You wouldn't! And yes. You have been a hero, and I would feel hurt if you let your success go away." Stacy typed: "I don't think you will feel very good after all that! Your choice though... right? :)"
Jan responded: "Are you planning on eating anything else today? Please think of your goals and how far you have come." Gerri writes: "Yes, I do care. People are counting on you. For me, if I'm face first in a pizza, the rest of my life is going down the tubes. Once I make excess food a priority in my life, everything else becomes unimportant. So, I hope you really aren't going to do that, Sean." My response to it all: "I was slightly annoyed by the prank, sure, just because of the time I chose to invest on clarifying everything and responding to messages of "don't do it Sean!!" But I'll tell you this, I would never ask "Do you care?" in a post--Not my style, I don't need to be constantly reassured---BUT, it was very heartwarming to read and accept the amazing outpouring of support and genuine caring. A couple of lessons learned: Always sign out of FB, and always be flexible enough to have a good sense of humor about yourself...although this transformation business is of a very serious nature, occasionally it's good to laugh--even if it's at your own expense...I'm confident enough now to fully understand and appreciate most of the mental dynamics in play. I'm not an expert, and I don't know everything---But I've learned some valuable things about myself along this road." This response wasn't the end. I was inspired to enjoy pizza and ice cream for lunch Friday, and I did---both of my favorites, and all for only 265 calories. 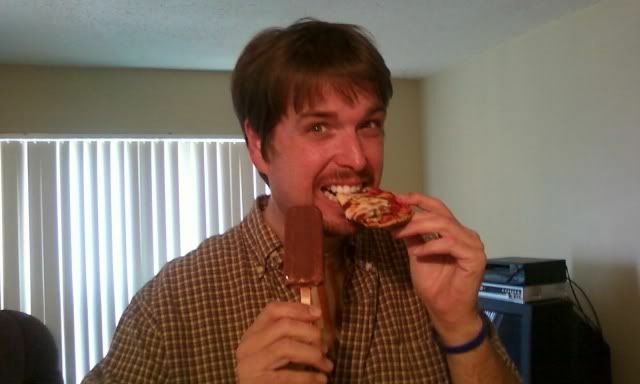 I did it because I love pizza and ice cream, but i also wanted to prove a point. You don't have to give up the foods you love in order to lose weight. So, the question...How did I enjoy pizza and ice cream and only invest 265 calories? I used a Joseph's Flax, Oat Bran, and Whole Wheat Flour 60 calorie pita, a tablespoon of pizza sauce for 15 calories, a 50 calorie pre-portioned slice of real mozzarella, and 10 calories worth of fresh mushrooms. Baked it at 400 for about ten minutes, took it out and sliced it into two big pieces--and enjoyed! The 130 calorie ice cream bar from Blue Bunny was a fantastic portioned controlled serving for dessert. Total: 265 calories for a pizza and ice cream lunch. I should have had double cheese for a 315 total, Hmmm, maybe next time. 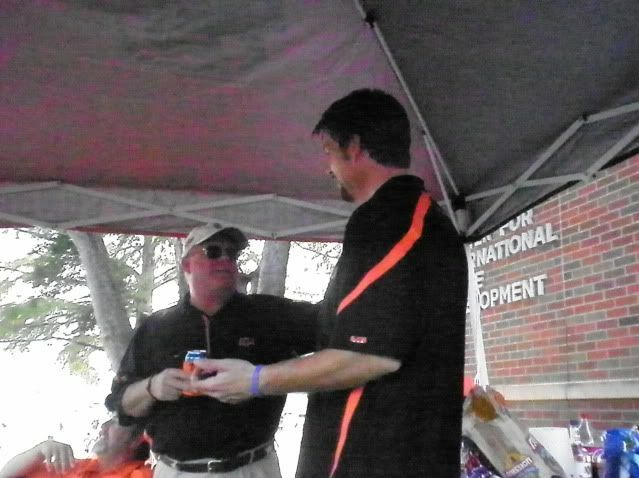 Saturday was free of radio related responsibilities, so I happily accepted an invitation to the OSU-Tulsa football game. I was the DD for some friends to the game and home. In between, I enjoyed the tailgate celebration, and found some time to get away from the stadium for a visit with Kelli while she worked and with mom and grandma. I went very easy on the tailgate food offered, opting instead to enjoy a couple of 163 calorie beef tacos from Taco Mayo. I picked up the tacos on the way to visit everyone, and grabbed some for them too. Those things are incredibly delicious--well worth my 326 calorie "investment!" While enjoying the game, I couldn't help but think about how different things are for me now. I took the stairs, with ease. 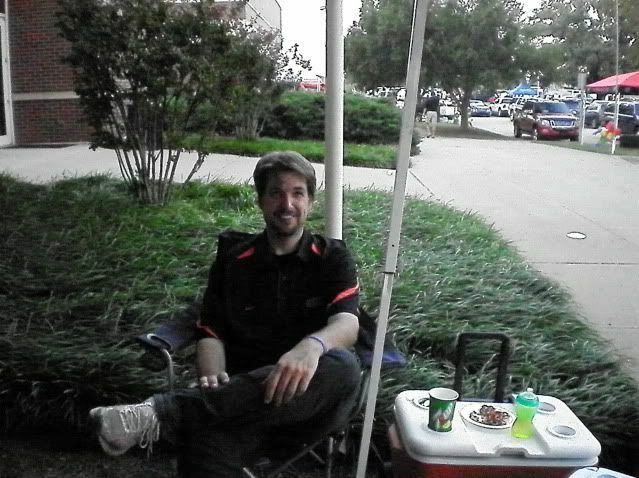 I'm sitting in a limited space, but not at all concerned with crowding the people around me. I'm living and breathing a beautiful existence that I once dreamed about...here I am...changed, transformed--living life free from the traps of obesity. My leg doesn't hurt because there are no sores to pain me. My chest doesn't hurt when I exert myself up the stairs, I'm not even the slightest bit winded. This is what freedom feels like...wow, it's just beyond words. 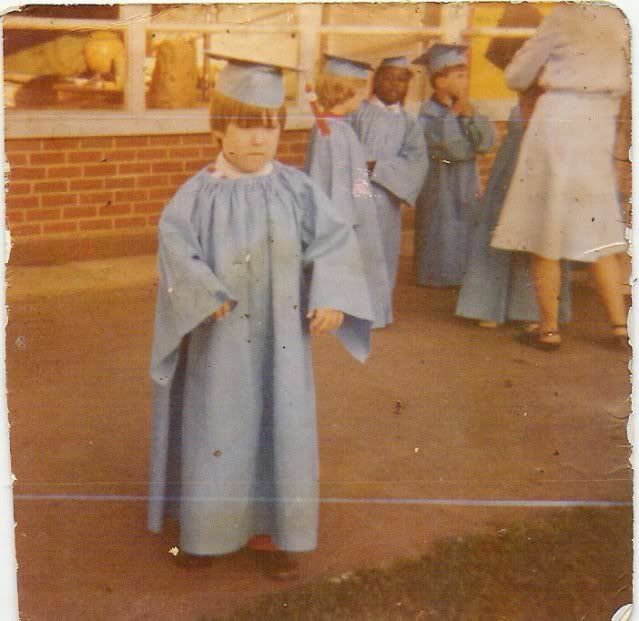 A grumpy little boy---graduating from the Head Start program. 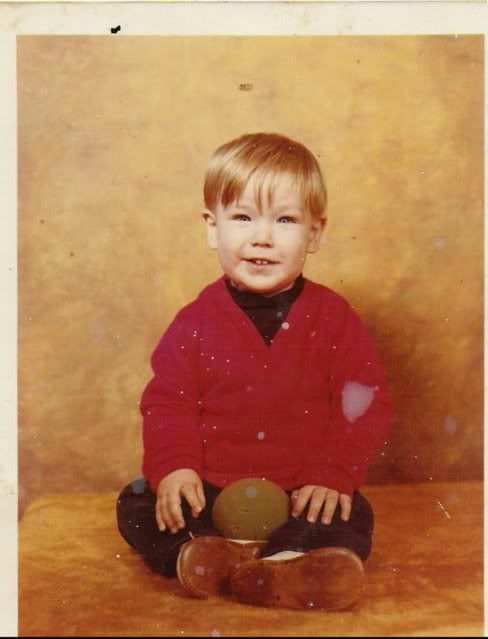 I don't remember what I was so upset about...maybe I should ask mom, she took the picture. My pizza and ice cream lunch. 265 total calories! Only half the pizza in this photo. 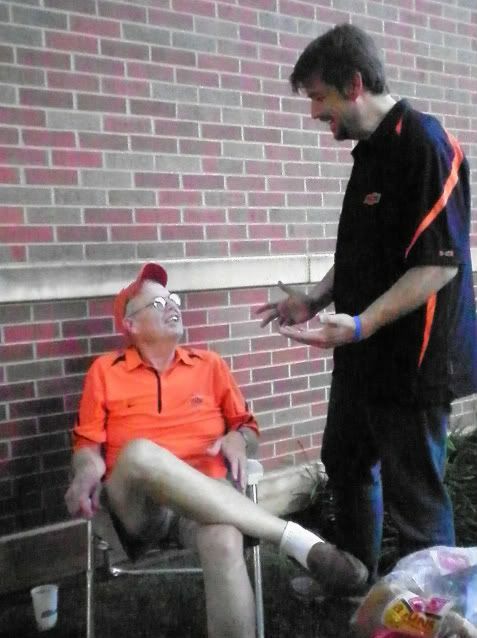 Visiting with Pat O. 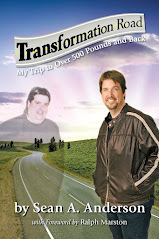 He's lost over 140 pounds!! In the last four days, I've completed a 5K and a spinning class, not necessarily the crazy workout schedule I talked about or thought about doing a couple of weeks ago. For some irrational reason, I decided it would be a great idea to hit 230 by the 15th, my two year anniversary along this road. Could it have been done? Yes. Would it have been a natural part of my lifestyle at this point? No. It's funny how, every now and then, I come up with something that completely goes against the grain of my core weight loss philosophy. This idea of hitting 230 by the 15th was one of those times. It was simply a thought, because it would have been cool to "do it all in two years." So, what if I say "it took me a little over two years?" That's still incredible. And as I've written many times in the past, time doesn't matter when we're making good choices that come naturally with our daily lifestyle. We'll get there, one good choice at a time. Hitting 230 by the 15th was a silly little departure from rational thinking. But boy...did I come close! I've had two people ask me why I would drive all the way to Stillwater to weigh, when I can weigh on any scale I so desire? It's poetic. That's why. That's pretty simple to understand. To weigh 230 on the same scale that started it all, and not just this time---but every other failed attempt in the last 14 years started on this same scale---is poetic. Returning to the scene of my major reality check in a much thinner and triumphant way, is something that's just worth the drive to me. I love it! I knew I wasn't hitting goal today. If I had lost 9 pounds in the last four weeks, I would have known. I did feel like I had lost, but not that much. Every pound seems to be noticeable to me now. It's interesting, very interesting. I was thinking maybe three--instead I had a 5 pound loss...No, wait a second...the scale was fluctuating between 234.4 and 234.6...Uhg! 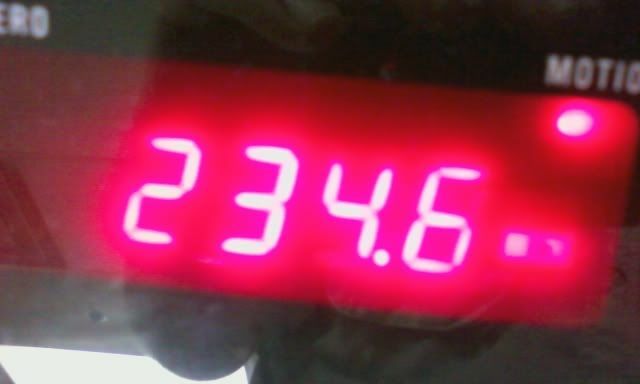 I always round up or down...and since it was mostly on 234.6, I must call it 235, for a four pound loss. I'll take it, that's fine. I'm happy, I feel great, and I refuse to allow myself, for even a second--to have a negative thought about this four pound loss in the last four weeks. See what I'm talking about when it comes to the unnecessary frustrations we sometimes allow? It's positive results and it's all good. I remind myself about the body fat analysis I had in the late winter. Maybe having little left to lose, makes what I do have want to hang on. Maybe my body is trying to preserve itself---trying to survive. The last thing I'm going to do is get all caught up in scientific explanations and complications. 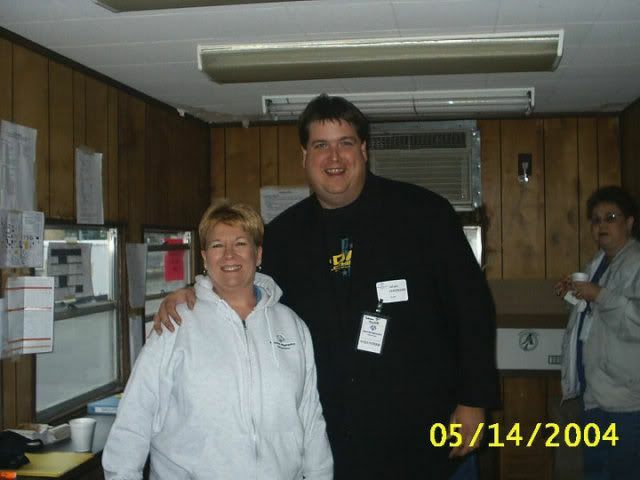 I'm in a wonderful place, and that's the bottom line: 270 pounds lost in exactly two years. I can feel incredible about that always. My aunt Kelli recently found a bunch, and I mean a bunch of "lost," never before published before pictures. I've included many of them below for this very special anniversary post. Thank you Kelli!! 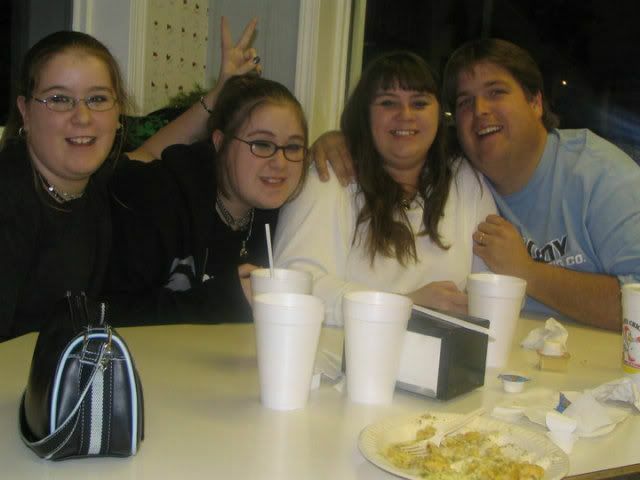 You can check out Kelli's weight loss blog at www.snoconegirl.blogspot.com Love you sis! I'm often asked how I've lost so much weight. It's very natural and often the first question I get from someone I've just met. On a milestone day like today---it's a perfect time to provide the excerpt of "The Long Answer to---How?" 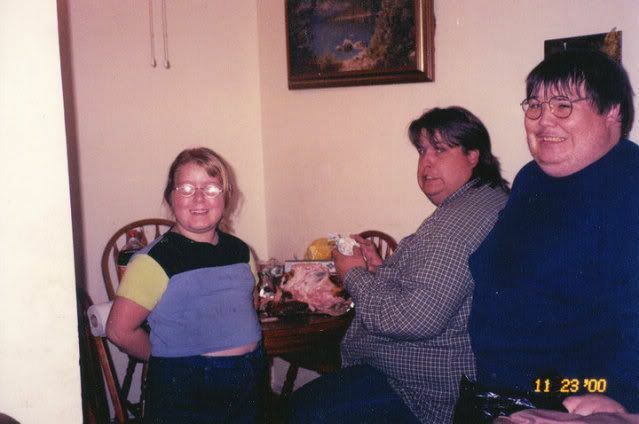 Readers of this blog know that I've struggled my entire life with obesity. So why am I having so much success now? Because I've decided. I've written before about making that “Iron-Clad Decision,” and it's that decision to succeed, that rock-solid commitment to consistency that has given me these incredible results. I found out that you have to give this journey an amazingly high priority. You have to make it one of the most important things you do. You have to defend your journey from anything and everything that might try to derail it. You have to protect it from yourself. I was always my own worst enemy, I understand that. When you make it this important, it really makes it hard to rationalize bad choices, you know what I mean? As dramatic as it might sound, this is life and death stuff my friend. And no matter if you have 30 pounds or 300 pounds to lose, if you give it that “do or die” level of importance in your life, you're less likely to fail. But is it that easy? Just decide? Really?? Make it important? What?? No. Along with my “Iron-Clad” decision, I decided to throw away every single misconception I had about weight loss. I knew I wanted long term results, I really wanted to change. So I eliminated any plan that wasn't completely natural. I needed something I could do that would keep me thin the rest of my life. I needed to learn what a normal portion looked like. I didn't want a 'meal replacement” type plan, or a pre-packaged food “weight loss center” type of plan. I knew those type of plans were simply a means to lose weight temporarily. I needed to confront my behaviors with food in everyday situations, and it had to be head on with real food like everybody else eats. I then determined that nothing was off limits. I could eat anything I wanted, and I mean anything! That element of my journey has been one of the keys to success, because if nothing is off limits, then I'll never feel deprived...and I'll never feel defeated because I enjoyed something that conventional weight loss wisdom says you can't have if you want to lose weight. It's not the food, it's the portions. Counting calories was a natural choice for me. It's taught me about proper portions and it's forced me to make better choices along the way. I opened the “Calorie Bank and Trust” in my mind, treating my calories like cash. Every morning I would be issued 1500 new calories that I could use however I wanted, but beware! I quickly learned that good choices meant making wise calorie “investment” decisions. I had to spread those calories out all day long, or run short as a consequence. The “Calorie Bank and Trust” doesn't have an ATM. When the calories are gone, they're gone until the bank “opens” the next morning. It might sound silly, it's not---look what it's done for me. But those urges to binge, how do I control those nasty things? Those crazy thoughts that sometime come from out of nowhere, stealing away my resolve, making me fantasize about eating large quantities of anything that I love, yes they existed for me just like everyone else. How have I handled that? Motivating thoughts plus accountability plus writing out my thoughts every night in this daily blog. That's how I've handled those journey breaking meltdowns. I tell people: Cling tight to those motivating thoughts, defend your journey like your life depends on it, in most cases it does. Decide that nothing...no emotion, no circumstance, no person, place or thing is allowed to steal this away from you. I deserve this success. You deserve this success. It's too important my friend. One of the biggest elements is self honesty. This means calling yourself on all those excuses and rationalizations that we tell ourselves in order to feel better about bad choices. Honesty, 100%---at all times. And exercise? Anything...just move. All I could do in the beginning was walk and I could barely do that for very long. But I was moving. And the more you move, the easier it gets. All of a sudden my 505 pound near deadly quarter mile walks became a mile...then two, then three, and so on. In the beginning it doesn't have to be anything special. There's no machine to buy or membership required. Just movement. After a while you can get fancy. But set a solid foundation of success first by mastering the basics. I'm still discovering ways to communicate what I've learned along this road. The blog posted a couple back into the archives, featuring "The Wrong Battle," is and was an epiphany type experience for me. If you haven't read it, click here. Rounding to 235...Anyway you slice it--it's all good!!! This is cool to me. 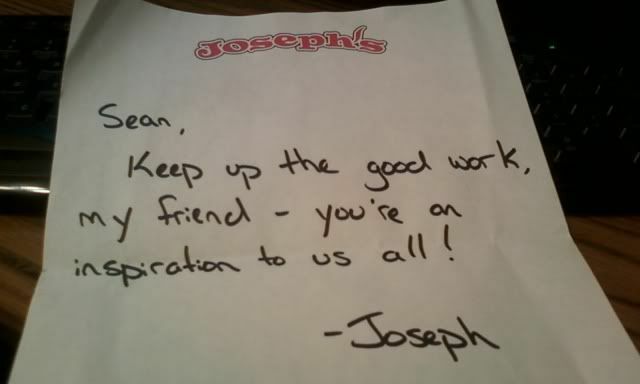 Thank you Joseph! With Skyler and Lauren Donahue at the fair Tuesday night!! !